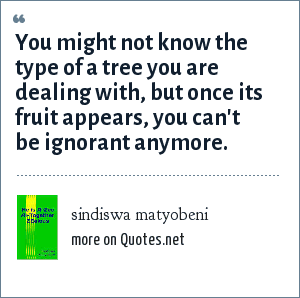 sindiswa matyobeni: You might not know the type of a tree you are dealing with, but once its fruit appears, you can't be ignorant anymore. "sindiswa matyobeni Quotes." Quotes.net. STANDS4 LLC, 2019. Web. 24 Apr. 2019. <https://www.quotes.net/quote/73945>.